Seattle is one of the most picturesque cities in the world. Whether it’s the mountains, water, Space Needle, or the city’s numerous sculptures, it’s easy to find a subject for a photo. 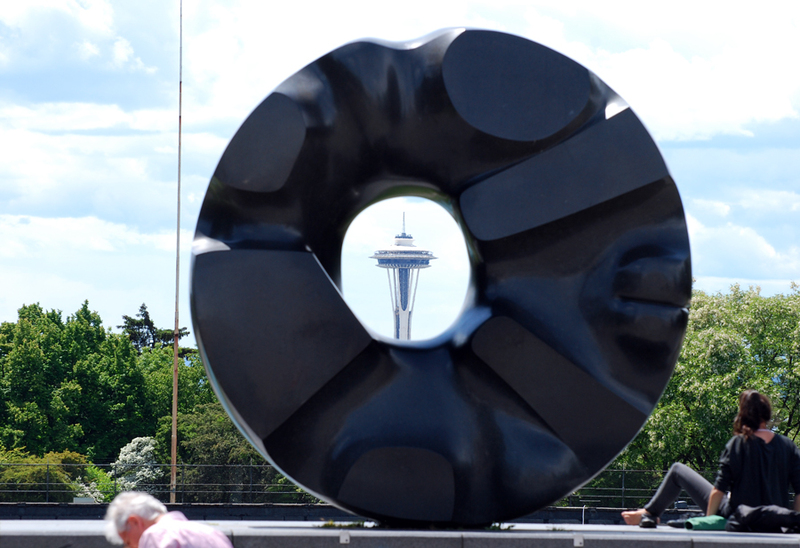 While there are several places that offer the ‘best of Seattle’ all in one spot, the Black Sun sculpture in Volunteer Park is unlike any other. Black Sun is located in the heart of Volunteer Park. It sits just outside of the Seattle Asian Art Museum (1400 E. Prospect St.) and near the Volunteer Park water tower. Black Sun is a large Brazilian granite sculpture that measures nine feet in diameter. It’s a rigid, dark black circle with a hole in the middle (almost like a bagel or doughnut). Looking west at the sculpture, you can see the Olympic Mountains, Puget Sound, and if you maneuver to the correct angle, Black Sun perfectly frames the Space Needle for a fantastic picture. Black Sun is a 1969 sculpture by Isamu Noguchi. I’ll be honest with you — I had never even heard the guy’s name until I did some research for this post. Little did I know, Noguchi was a “prominent Japanese American artist and landscape architect,” according to his Wikipedia page. His career spanned six decades (starting in the 1920s), and his work can still be found all over the world. Noguchi was so popular that he even has his own museum in New York City. NOTES: Some speculate that Soundgarden came up with the name of their hit song ‘Black Hole Sun‘ from the Black Sun sculpture in Volunteer Park, but I can’t find any firm information to back that up. The band however did take its name from the A Sound Garden sculpture near Magnusson Park (according to several online sources). Black Sun gets plenty of visitors every single day. I’ve visited Volunteer Park several times, and there’s usually a group of folks surrounding the sculpture. 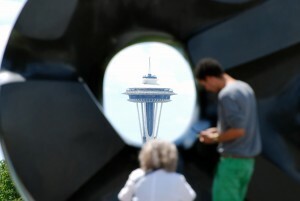 Some take a seat in the center of Black Sun, while others snap the popular Space Needle photo or simply soak up the surrounding beauty of Seattle. It doesn’t matter how you choose to enjoy Black Sun…just get out and see it. Have you ever checked out Black Sun? What do you think of it? We’d love to hear from you! Leave a comment below or connect with us on Twitter, Facebook, and Google+. 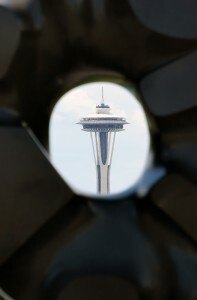 Don’t forget to also visit Seattle Bloggers for more cool places to experience in the Emerald City!